Ranfurly Castle lies to the western edge of the large village of Bridge of Weir, which prospered in the 18th and 19th centuries thanks to cotton mills and tanneries. Considering its close proximity to Glasgow, Ranfurly Castle Golf Club remains relatively undiscovered, except to those in the know. Willie Campbell laid out the club’s original 9-hole course then, after moving to its present location in 1905, Andrew Kirkcaldy established the club’s new 18-hole layout. James Braid made some alterations in 1923, seven years before six new holes were introduced, following the purchase of 48 acres of additional land. Its hilly moorland aspect provides a great sense of adventure and escape. This course really should be better known. In 2003, the club hosted the £10,000 Tartan Golf International Trainees Matchplay Championship, which commenced with an 18-hole pro-am with one of the amateurs in each team being under the age of 14. The opening two holes at Ranfurly Castle take you steeply uphill to a high moorland plateau where the views open up. Fourteen holes play on top of the moor before the closing two holes bring you back down to the sanctuary of the clubhouse. Measuring less than 6,300 yards, Ranfurly Castle is not a slog, but when the wind blows – as it so often does on the top – it presents a stern challenge. With just one par five and only three par threes, scoring well on this par 70 course is not as easy as it first appears. Ranfurly Castle is often bracketed alongside Gleneagles and certainly there is a hint of elements of both the Queen’s and King’s courses, but Ranfurly Castle is much less contrived and it’s much quieter too. It’s certainly a gem if ever there was one and it’s also great value. Well worth a visit… but beware of the wicked, slick greens. I played the course in 2018 and managed to get out early in the day. The course wasn't in the best of condition and would benefit from more drainage. The greens were good, despite being very soft they rolled fast. I took advantage of the James Braid reciprocal agreement but would pass on that you may be asked to show proof, so remember your home club bag tags etc. After getting the first two climbing holes out the way, the scenery opened up and great views were to be had. The course definitely has the same DNA as the Kings and Queens at Gleneagles with some excellent and rewarding par 3 holes, in particular. Overall I thought things were pretty average, I wouldn't play the course again. I can’t believe there’s been no review posted for this course in almost six years – perhaps that’s one of the reasons why Ranfurly Castle lies in a relatively modest 4th position within the regional listings and outside the national Top 100 (when I have the course sitting comfortably within my personal Top 100 for Scotland)? Nearby Kilmacolm has attracted much attention in the rankings in the last couple of years (and rightly so, as it’s a cracking wee track) but, with the narrow beam of the spotlight falling on that other fine moorland layout, a mere 4 miles to the north west of here, it means that this place has been largely overlooked, something that really needs to be addressed. I revisited the course yesterday and have to say I was mightily impressed once again by the layout. The previous reviewer was more than a tad harsh to term the par threes here as “uninspiring and mundane”. I can assure you that all three short holes on the card are very good, with the two on the front nine (“Wee De’il” at the 5th and “Crannag” at the 7th) of a particularly strong vintage as both call for heroic carries across broken ground from elevated tees to distant greens – absolutely thrilling holes that get the pulse racing just a little faster when you’re standing on the tee. The 8th, played to a raised two-tier green, was again as difficult as its stroke index of 1 might suggest (even without a wind blowing against) and the horseshoe of five pot bunkers protecting the front of the green at the short par four 10th really does form a formidable obstacle in the pursuit of a birdie opportunity. The blind tee shots over rock escarpments at holes 9 and 15 also offer a modicum of quirk out on the moor before the course routing freewheels back down to the clubhouse over the final two holes. The fourth paragraph in the above course article states: “beware of the wicked, slick greens”. Well, I can certainly vouch for the sleek, polished nature of those putting surfaces, which were easily the best that I’ve putted on for a long time. Add the springy, free-draining quality of the heaving fairways at Ranfurly Castle and you have a wonderful golfing recipe that’s surely enough to satisfy the appetite of even the most demanding golfer. Ranfurly Castle is an amazing track, this should be a must in the top 100 list. The greens are firm and extremely fast. This course is very tough to as the rough is extremely thick and the fairways are narrow! It is a great course and a real test for golf, somebody has to review this again. First of all, what an impressive, multi-storied old clubhouse here – it’s enormous! I’d been here before last year to take photos near the clubhouse and it appeared to be a very well maintained parkland layout. It’s only as you climb higher onto the moor above that you really get to know the real course. There’s a lot going on up there - elevation changes, dog legs, blind shots, coffin bunkers and short par fours (at the 4th and 10th holes). Throw in some great rugged scenery, a variety of trees, ferns, gorse and purple heather and you have a heady mix that could easily make you think you were playing in Perthshire and not just a few miles from the big metropolis. The only par five on the card, “Valley” at the 3rd was an excellent hole but my favourite was the toughest on the course, the 454-yard, par four 8th (“Rowans”) at the furthest point from the clubhouse. It is not the toughest track you will play but it is a very fair test with excellent greens that will test your putting mettle. 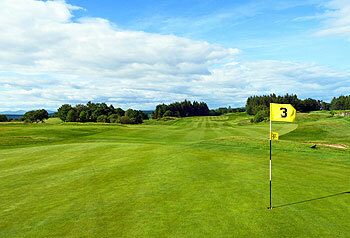 Had a lovely 36 holes here last week on a warm, sunny day. Had never played it before but was most impressed by the layout, condition and presentation.After a couple of early climbs the course levels out in the hills above Glasgow and winds its way across the moors in an attractive, secluded setting. 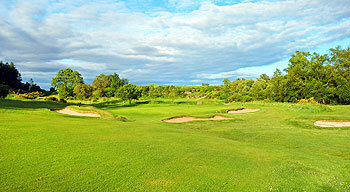 Not a difficult course but an extremely fair one with excellent holes such as the par 5 3rd and the par 3 7th. The downhill finish at 17 and 18 more than make up for the uphill start and overall Ranfurly Castle, like its near neighbours Kilmacolm and East Renfrewshire, affords a most enjoyable golfing experience. Everyone has there more obscure favouites, and this is certainly one of mine. The setting is tranquil and scenic, with great views down over Glasgow in the distance. The course is generally quiet, especially midweek, and the fee's are reasonable.The course itself is a shortish 6,284yards, par 70 over rolling moorland. The holes are diverse and interesting with questions being asked of even very good golfers at most holes. Well worth a visit, and its close neighbour Old Ranfurly Castle is also worth a play on the same day.